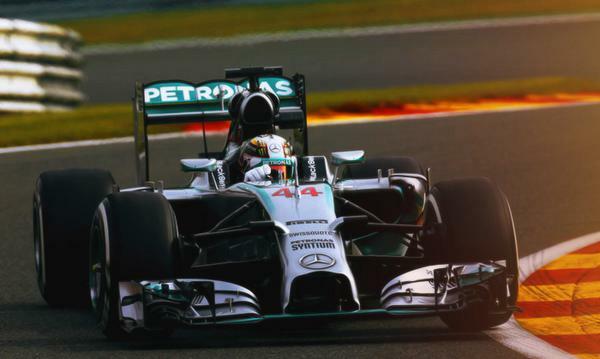 Home » Formula One: Mercedes fastest on Friday in Belgium as F1 musical chairs continues! 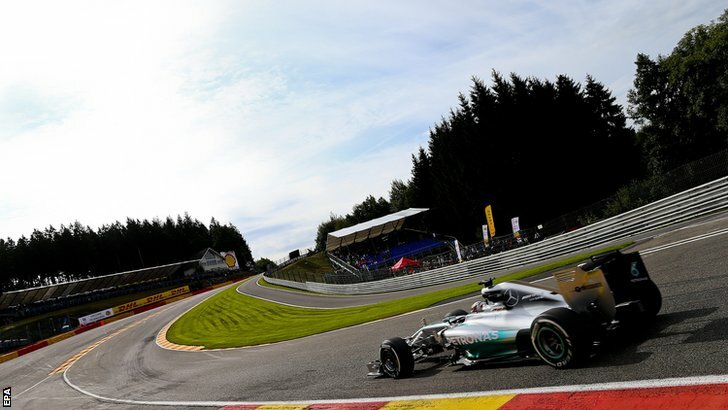 Formula One returned after the August summer break with the first practice session for this weekend’s Belgian Grand Prix at the historic Spa Francorchamps. The Mercedes pair took the fastest times in both sessions. Andre Lotterer and Alexander Rossi headed into the session preparing for their Formula One debuts, with Rossi unfortunately learning that regular Marussia driver Max Chilton would deny him of his first F1 start after being selected to race once again. Nico Rosberg just edged out team-mate Lewis Hamilton in the first practice session by 0.097 of a second. Hamilton had held a slim advantage at the start of the session, but seemed to lose out in the final chicane to his team-mate. Fernando Alonso was 3rd fastest for Ferrari despite having a strange stop at Eau Rouge. The Spaniard had just set the fastest time of the session when he suddenly pulled into the old pit exit on the inside of Eau Rouge and came to a stop. It was only a brief pause however as he was soon under way once more. Jenson Button was just behind him in P4, with the 2012 winner hoping for a resurgence of pace in his McLaren. Kimi Raikkonen was 5th fastest in the second Ferrrai. The two Force India’s were 6th and 8th, sandwiching McLaren’s Kevin Magnussen. Sergio Perez and Nico Hulkenberg head into the weekend hoping to emulate the somewhat tradition of good pace from Force India at Spa. Daniel Ricciardo was 9th fastest for Red Bull ahead of Valtteri Bottas in 10th and Vettel in 11th. Alexander Rossi made his debut in the Marussia F1 car in what was supposed to be preparation for his F1 race debut on Sunday in place of regular driver Max Chilton. However, just as the session got under-way, news broke that Chilton would in fact take his car back from Practice 2 onwards and would race after all. Team boss John Booth had said yesterday that Max wouldn’t drive due to contractual issues while Max said that he had ‘voluntarily’ stepped aside to help the team. Rossi went on to finish P20 in the session, but will involuntarily step aside for the second session. Andre Lotterer got his first taste of a 2014 Formula One car in the session as he prepares to make his F1 debut in Sunday’s race. The Le Mans winner had a solid first session as he finished P21; a tenth ahead of team-mate and regular driver Marcus Ericsson. After topping the first session, Nico Rosberg had to settle for 2nd in practice 2 later on in the day. Lewis Hamilton topped the session once again and is undoubtedly the king of this particular session this year after topping FP2 all but 2 times. Nico Rosberg may have been closer if it hadn’t been for a slight excursion into the gravel on his fastest lap. Fernando Alonso maintained his status of being best of the rest in 3rd place and was the only non-Mercedes driver within a second of Lewis Hamilton. Felipe Massa and Valtteri Bottas showed some good pace for Williams in 4th and 6th, with Jenson Button continuing his FP1 form in 5th. Daniil Kvyat was impressive for Toro Rosso in 7th; 2 tenths ahead of Daniel Ricciardo’s Red Bull. Kevin Magnussen and Nico Hulkenberg completed the top 10. Kimi Raikkonen had a difficult session down in 15th after numerous engine problems meant that the Finn would complete just 18 laps as opposed to the session high of 31 set by the McLaren pair. The session was interrupted twice in the first half hour of running with two red flag periods. The first was due to another strange crash for Pastor Maldonado. The Venezuelan exited turn 9 and appeared to drift straight off of the track. He lost control of the car on the grass and wiped the front wing off of his car and also took damage to his rear wing. The second red flag followed a spin for Esteban Gutierrez at Blanchimont after a gearbox problem. The car was unable to get going again from the outside run-off area which led to the session stoppage. Sebastian Vettel was last in the session after an electrical problem from the end of the first session led to an engine change that would mean he would not emerge at all. It also means that he will take a 10 place grid penalty.